Okay, I'll admit it. When I found out that I was getting a cookbook that was all about potatoes, I was kind of excited. I like potatoes. And I'll admit it - I'm not always creative with them. 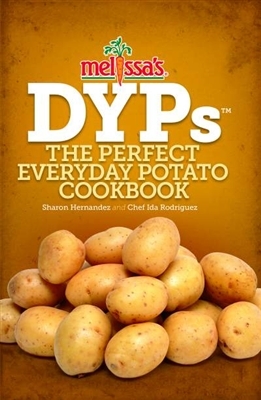 But Melissa's DYPs: The Perfect Everyday Potato Cookbook isn't about potatoes in general - it actually focuses on one specific type of potato - the Dutch Yellow Potato, a waxy yellow-fleshed potato. That doesn't mean you can't use the book if you don't happen to have those particular potatoes on hand. I'm a big fan of substituting ingredients to use what I have, rather than abandoning a recipe - or a cookbook - completely. And then I go hunt down the actual ingredient for another recipe. While this book is all about potatoes, it's not all potatoes all the time. Of course there are potato-centric recipes like grilled fries, chips, and potato leek soup. But there are also a lot of recipes where potatoes are a component of the dish while not being the star of the dish, like chicken pot pie, gorditas, and red bell pepper soup. To be honest, I was a tiny bit relieved to see that much variety. Compared to some of the stunningly beautiful cookbooks that are being produced these days, this one is a little less flashy. If you're looking for food art or a coffee table book this probably isn't what you're looking for. On the other hand, if you want a cookbook that'll give you a lot of ideas on how to use potatoes, then this one's got you covered.